Mikhail Kalashnikov, the inventor of the legendary AK-47 assault rifle, has died. You may not recognize Mikhail Kalashnikov's name, but you almost certainly know his work: The AK-47, an assault rifle he designed in 1947 (hence the name) which went on to become one of the most famous, influential and instantly recognizable firearms in the world. Renowned for its simplicity, ruggedness and reliability, Kalashnikov's rifle has seen use throughout the world by regular military forces, paramilitaries, terrorists and low-level street criminals. Kalashnikov designed many other weapons during his career, including the RPK light machine-gun and the PK GPMG, but it was the AK-47 that made his name famous around the world. Kalashnikov was born in Russia in 1919 and was conscripted into the Red Army in 1938, where he served as a tank mechanic and then a tank commander. In 1942, after being wounded in the Battle of Bryansk, he was assigned to the design division of the Chief Artillery Directorate of the Red Army, where his career began in earnest. He earned a Doctor of Technical Sciences degree in 1971. It's estimated that more than 100 million AK-47s have been made, but because many - the majority, according to official manufacturer Kalashnikov Concern - have been produced without proper licensing, it's impossible to say how many actually exist. In 2007, Russian President Vladimir Putin described the rifle as "a symbol of the creative genius of our people." 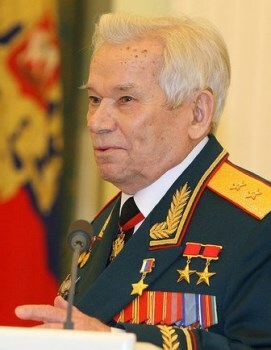 Kalashnikov had reportedly suffered from heart troubles over the past few years and had been hospitalized in intensive care since mid-November. He was 94.